These days headlines like this are splashed all over the financial news media. And it is true, oil is lower today than it was in the summer of 2014 – much, much, much lower. Yet perhaps the most important question is not being dutifully explored: Is lower oil a good sign or bad sign for the global economy? Stock markets as of late seem unsure, and it is quite easy for pundits to throw around glib arguments in defense of one view over another (wait … this isn’t unique to oil!). But what does the data tell us? Let us get right into the numerical weeds. Allow me to begin with a succinct statement underscoring my baseline thesis: Seldom have falling oil prices been a leading indicator of economic recession. One case to the contrary was 2008/09 when lower oil prices were in fact a reflection of eroding global demand as the world foundered in a state of economic turmoil. *Although, if we wish to get truly technical even 2008 is not a sufficient example as falling oil prices began over six month after the economy was already in recession. That is to say, it was actually a lagging economic indicator* Similar to most other periods of falling oil, the recent decline of the past six months seems to be mainly driven by a significant supply-side shock against what was a persistent and artificially high price level ($95+). Add to this a small dash of slowing consumption growth (which to be fair is likely a longer-run trend, but that’s for another blog) and supply/demand begins to experience some disorder. To be sure, not only is the oil market now trying to find fresh equilibrium it is also battling Wall Street’s attempt to unwind its net long positions amid ever-souring sentiment. These selling forces have been and remain in control of the market for crude oil. 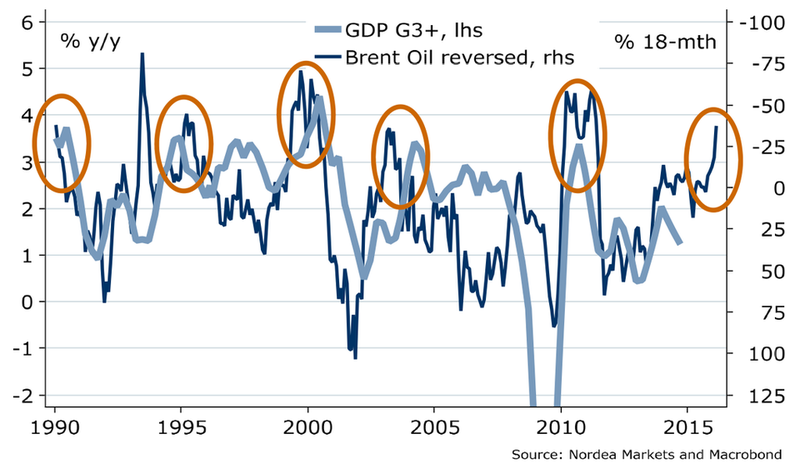 Per Nordea Markets and Macrobound (furnished by Business Insider) over the past 25 years global GDP tends to pick up following a large drop in the oil price (note the inverted scale on the right to show the relationship more cleanly). Indeed, according an to an IMF study for every 10% drop per barrel global GDP rises by approximately +0.2% (on an annual basis). Primary factors central to this analysis include the consumer receiving extra cash to spend on other items because they are putting less of it into their automobiles and heating bills (Brookings Institution calls it $500 “tax cut” per household) as well as a boost to household confidence. Net energy importers like the U.S., China, Japan, India and most of Europe benefit from lower prices because they spend less on buying oil. At the business level, the great majority of sectors outside of energy – e.g., transportation companies, industrials/manufacturing businesses, retail, health care, and tech – see lower costs of doing business (component costs, shipping costs and various other overhead). Not only do lower oil prices provide a nice tailwind to the macro economy, but it should also help bolster corporate margins that remain at multi-decade highs. Exhibit B, this chart from BondVigilantes (via Business Insider) going back to 1961. It says virtually the same thing but only in the reverse. 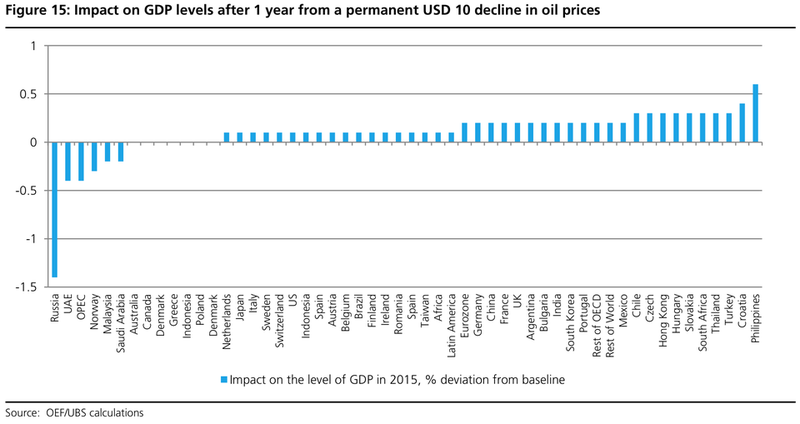 Whenever oil prices dramatically rise world GDP growth slows. Still not convinced? Enter UBS data (via Business Insider) to further clarify the picture – same narrative, different angle measured. Fair enough. But the above thesis only seems to make sense if one truly believes that demand for oil – or put differently, global economic growth – is in fact holding together. So what makes me confident that this is indeed the case? First, the U.S. economy (still a major oil consumer) is picking up pace and broadening out. We are seeing this across a series of principal factors: jobs, manufacturing/production, retail sales, consumer and business confidence, as well as various transportation and shipment metrics (here, here, and here). Second, while the global economic picture remains a mixed bag several key economies are seeing an up-tick in growth and expectations. 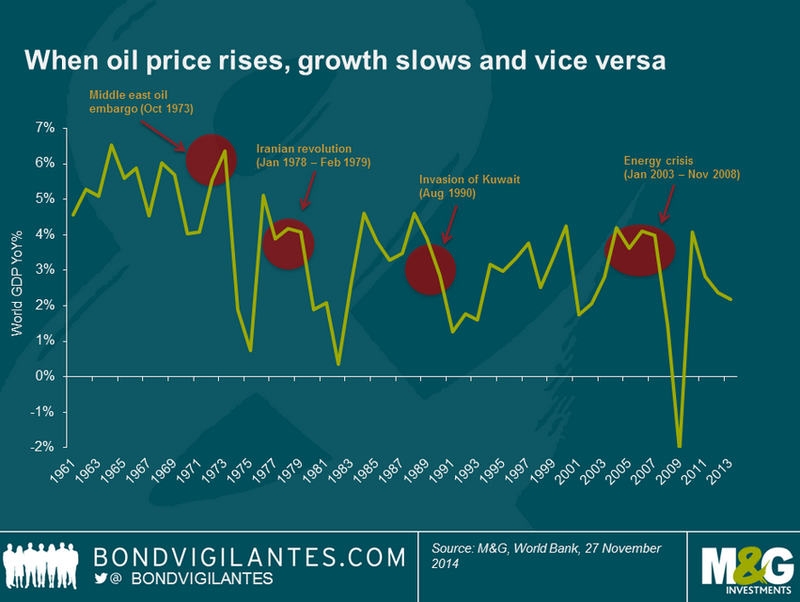 India, post-election, is experiencing just such activity and is a large and growing consumer of oil. While it is true that in China the rate of economic output has slowed it is also true that they are still expanding at about a +7% clip with an increasing chance of additional stimulus measures yet to be deployed (be it fiscal, monetary, or both). What’s more, we must not forget that China is still in the process of building a strategic petroleum reserve (SPR) and remains several hundred million barrels shy of their target level. And in the past China has proven itself a savvy buyer of mission critical commodities; as prices fall I imagine that they are likely accelerating their procurement of this crucial resource. Third, Europe and Japan remain wild cards in the global landscape. Growth has been hard to come by for both economies and deflation is a real risk. Needless to say general expectations for anything out of these two regions are almost non-existent, and are certainly not priced into the oil market at these levels. This suggests that the bias may be to the upside if the ECB can properly execute on full-scale QE while lapping despondent Russian sanctions without further escalation; and if Abe & Kuroda get what they want out of their three arrow approach aimed at resuscitating Japan’s moribund economy. Higher level, most major energy organizations – the EIA, IEA, and even OPEC – forecast slight growth in global oil demand of +1.0% to +1.2% for 2015 despite the ultra-bearish mood gripping the markets. This pace of growth may appear unexciting … but that’s because it is. We must consider the greater context to understand why this is not (yet) worrisome. Over the course of this economic recovery global oil consumption has averaged approximately +1.5% growth per year – a rate noticeably lower than the previous five-year period (approximately +2%). Knowing this, one could aptly observe that 2015 may simply be a continuation of an on-going global narrative depicting slowing demand growth due to secular factors as opposed to contracting demand due to a cyclical economic downturn (like we saw in 2008 where oil consumption did actually contract by -1.6% from 2007 levels). Despite the data, I am completely open to the idea that the tepid growth mantra could be wrong and something more sinister is afoot. This would not be unusual in the tricky field of forecasting. Be that as it may, given the preponderance of present data I am placing a higher probability on small-scale consumption growth for oil in 2015. As a result the best conclusion I can draw, taking into account all of the puts and takes, is that falling oil prices are, at least up to this point, principally a function of rapid world supply growth and thus with the underlying economic foundation still intact will result in higher, not lower, global GDP growth rates.